Cigar clubs are a great way to get together with friends, try some new cigars and spirits, check out a local cigar shop that you’ve never found time to visit, and sit and bond with your fellow cigar enthusiasts. Women have book clubs, men have cigar clubs. I recently sat down with Paul Medenwaldt, president of The Havana Nights Cigar Club from the Twin Cities, who gave me the lowdown on running a cigar club. The club meets on the first Tuesday of every month at a shop called Little Havana Tobacco in Anoka, Minnesota. Started by a group of guys who wanted to get together with like-minded people and try new cigars, it also became a vehicle for a local cigar shop to bring more people through its doors—people who otherwise might have never stopped by. When I asked Paul about the club’s membership and their experience as cigar smokers, he had this to say: “Most of the cigar club members are not guys that hang out on a frequent basis at cigar shops. This is their one day a month to get together with friends they may only see once a month. Most of the cigar members are beginners, but have been developing their palate over the years with the introduction to new cigars that the club smokes. “We try to get new cigars that come to market that the members normally would not know about or try. A lot of them know what they like and only smoke those cigars, but if they enjoy a cigar the evening of the club, they will then search it out at their local shop or online. It’s easier for one person to pick the cigar than for 30 people to decide. And some of the members don’t really care what gets smoked, they just want to socialize and try new things. There are monthly dues which go towards the purchase of cigars and spirits, so when you arrive on club night, your cigars and drinks are already there. The club also holds raffles for cigars and cigar accessories. He continued: “Decide on what the purpose of the club will be. Is it an evening where people get together and just smoke a cigar and have a spirit? Will the focus be to review the cigar you are smoking and to publish those results for the rest of the world to see? The Havana Nights club often works with local cigar shops that are open to hosting a meeting. Some shops may be willing to stay open later if it means new cigar smokers will be visiting their shops. Shops will always have new cigars they are willing to promote to new people the evening of the cigar club. “My experience is that I am selective when it comes to new members. You want to make sure they are there for the cigar and fellowship and not just for an evening of drinking. Start with core members who are knowledgeable and then find people who may be novices to cigar smoking but are willing to learn about new cigars. The challenge will be getting to those novices because they probably don’t hang out on a regular basis at a cigar shop and may only walk in and walk out of a cigar shop with their purchase or are online only purchasers. Once a club is up and running it pretty much takes care of itself. Paul will arrive early to make sure all the cigars and spirits are ready for when the members arrive and greet each member as they walk in. I had the pleasure of spending an evening with the Havana Nights Cigar Club and found it to be a very relaxed atmosphere dedicated to discussing cigars, sports, food, and whatever it is men talk about when they get together. You can imagine that I had a pretty good time. If anyone would like advice on starting or running a cigar club, Paul Medenwaldt welcomes your emails. Cigar City Magazine, the vision of Lisa M. Figueredo, is Tampa’s premiere magazine for information about the history of the Tampa Bay area. Lisa feels passionately about her blended culture, history, and family and started the magazine as a celebration of her heritage. Stogie Guys: How did Cigar City Magazine get started? Lisa Figueredo: I owed an ad agency and was up late one night working and was thinking of when my Abuelo Lee and Abuela Nena would have fresh hot Cuban bread and butter waiting for me when I woke up with some hot café con leche. Then my Abuela Nena and I would catch the bus and ride over to Ybor City for the day or sometimes my Abuelo Lee would take me to the local cigar factories to pick up the steams and waste from the tobacco leaves that he would use to spread on people’s lawns. I was thinking about how much I missed them and how I wished I could get those days back. That’s when I came up with the idea to write about my stories and the history of Tampa. I come from a long line of people who made a difference in Tampa. My family on my father’s side boasted the first Mayor of West Tampa who was instrumental in helping Jose Martí spark the Cuban Revolution and win independence from Spain. His name was Fernando Figueredo. On my mother’s side, her Great Grandfather Enrique Henriquez was the last Mayor of West Tampa. My Great Grandmother was also Carmen Ramirez who was a famous actress from Spain and was instrumental in raising money for the local theaters in Ybor City. SG: What is the best part about being the publisher of Cigar City Magazine? LF: The best part is giving back to the city I grew up in and love so much, and giving a voice to its past. People don’t realize the rich history we have here in Tampa and how lucky we are to be a part of it. If one article touches one person’s heart when they realize that, that’s the best part. SG: What makes Cigar City Magazine different from other cigar publications? LF: Contrary to our name, we do not rate cigars or write about individual cigars. Instead, we focus our stories on the cigar factories and how they got here. We also do feature stories on famous cigar pioneers like Arturo Fuente, Angel Oliva, J.C. Newman, and more. I got the name because back in the heyday of the cigar factories, Tampa was once nicknamed “Cigar City.” By the late 1960s, after the embargo of Cuba, factories were closing and many were going to machines. The name got lost until 2005 when I resurrected it by calling the magazine Cigar City. Seems now-a-days everyone is using it: Spirit of Cigar City, Cigar City Brewery, Cigar City Tattoo Convention, Cigar City Darlings, etc. People ask me all the time if I get upset when I see people using my trademarked name and I say, “Hell no!” We are Cigar City and I’m just happy I was able to make it come back alive. Plus, imitation is the sincerest form of flattery. SG: How much space do you dedicate to cigars, cigar industry trends, and Tampa’s local cigar bars and shops? LF: It’s hard to talk about Tampa without talking about the cigar industry. Though most of our stories are about history we do try and throw in a few things for our loyal cigar connoisseur. In our last issue we did an interview with Pete Johnson, owner of Tatuaje Cigars, and we have written stories about the famous cigar families and factories. We never rate cigars nor will we ever because we are Cigar City and we love them all. SG: One of my favorite issues is the Fidel Castro Mob issue. Are there any forthcoming stories or issues that you are really excited about? LF: I love each and every issue, but if I had to pick three, I would say our Mob issue, our Cuba issue, and the Cigar Woman issue. You can read them online right here. SG: Talk a bit about some of your recurring features like “Mama Knows,” “Café Con Leche,” and the “On the Town” photos. What can readers expect from these, and other regular features in the magazine? LF: “Mama Knows” is probably one of our most widely anticipated columns. Mama does not have a subtleness about her when it comes to giving advice; she tells it like it is. We left her out of an issue one time and I almost had a revolt on our hands from the readers. Mama gets more emails than any other staff member. Our “Café con Leche” is a cool column and mainly we interview famous and even sometimes a few infamous people now and then. Our “On the Town” is a great way to thank my readers. It’s mainly photos of them at all of the events we do or go to. SG: Who is involved in the magazine? Tell us a bit about the major contributors. LF: Cigar City is made up of many writers who, for the most part, just want to write about the history of Tampa. Some of these writers are famous, like Scott Deitche, author of Cigar City Mafia, to the daughter submitting a story about her father that worked in a cigar factory, to the professor at a major university. Then of course we have the great historian, Emanuel Leto, who also works at the Tampa Bay History Center, who really has made this magazine possible. Paul Guzzo, who used to write for La Gaceta, gives us many great articles like “Sleeping with the Enemy,” which tells how the Hillsborough Sheriff Office traded guns to Fidel Castro for the release of Santo Trafficante, Jr.
SG: Tampa has always taken great pride in its history and Cigar City Magazine has always celebrated that history. With such a rich history of cigars, the Cuban, Spanish, and Italian cultures, baseball and bolita, how do you decide what goes into the magazine? LF: It’s not easy. The best way I can explain it is like this: Remember when you got that first new bike and you wanted to show it off to the whole neighborhood and you just couldn’t wait? It’s like that with many of our stories. We usually always have so many in the pipeline it’s hard to choose. But I guess that’s what has kept us around for seven years…having good material for every issue. We thank Lisa for her willingness to sit down and talk with StogieGuys.com. Please visit Cigar City Magazine on the web to find the latest issue and subscribe. Or, if you live in the Tampa area, be sure to pick up the latest copy. You pick up this box of cigars for a closer look at this pretty girl—she’s the centerpiece of a brilliant arrangement of symbolic imagery, a romantic fantasy world meant to satisfy you, and you only. Around the woman, a wreath of gold coins appeals to your desire for wealth. Behind her, a flourishing tobacco plantation reflects her fertility. A pair of men far away ride horses and play polo, and just over her right shoulder stands a Roman warrior—the point of his sword planted between his feet and his muscular arms folded patiently across the hilt, waiting for the pretty girl to stop looking at you and give her undivided attention to him. But she never does. Despite the wealth that surrounds her, the fertile land, the sport, the heroic soldier waiting to take her in his arms, she never breaks her stare with you. From the moment you saw her, her eyes were planted firmly and eternally on you. You can’t put this box of cigars down because doing so would mean rejecting beauty and denying yourself of this beautiful woman, this lithographed seductress. And what man has the power to refuse a woman like this? You take the box to the counter and pay for your cigars, walking home with a new companion designed especially for you. The year is 1844. You are in Havana, Cuba. For a 19th century cigar enthusiast, the artwork on the box and label are as attractive as the cigar itself. In 1837, Ramón Allones named a brand of cigars after himself and became the first to wrap a label around the end of a cigar. But it was nearly 40 years before that when the Cuban trademark office, in 1810, recorded the first two applications for cigar brand registration: B. Rencurrel by Bernardino Rencurrel and Hija de Cabañas y Carbajal, by Francisco Cabañas. Cigar labels were one of the earliest forms of advertising and marked a shift to a consumer culture. Making the product unique, an attractive cigar label captured a customer’s attention and was as important as the cigar itself. 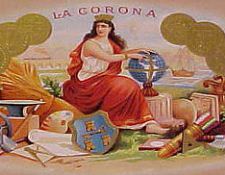 Ramón Allones, arguably the pioneer of this technique, used manly images of military shields and spears, golden lions, royal crowns, and colorful banners of victory. Years later it was Cuba Libre, and Teddy Roosevelt’s Rough Riders, that became popular themes on many cigar labels. But from the earliest cigars to the modern day Cuestra Rey, one image that has endured is that of the beautiful woman: the damsel in distress who can only be rescued by the man who lifts her off the cigar store shelf and carries her (and his billfold) to the nearest cash register. Angel Cuesta and Peregrino Rey, both in their thirties when they started the famous cigar company in 1896, were just a pair of entrepreneurs in a city with dozens of cigar factories. In fact, the Tampa Tribune thought so little of them that the newspaper didn’t even bother to check the spelling of their names and with little fanfare, announced that Cuesta Ray [sic] had formed in Ybor City, Florida, employing 100 workers. The paper would have never expected this pair of young Spaniards to create a revolutionary cigar company that would set industry standards for quality and marketing and become one of the most recognized brands in the world. 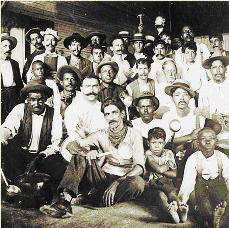 Cuesta and Rey’s idea of cigar company management included the novel ideas of international marketing, quality control, and worker incentives, ideas that are commonplace today but bordered on being radical during the 1890’s. But it was the unique talents of each man, and their ability to divide the responsibilities of management, that played a critical role in the success of Cuesta-Rey. Cuesta was a promoter, Rey a production manager. While Cuesta created brand identification and customer loyalty though shrewd marketing schemes, Rey ensured the quality of the product matched the reputation touted in its advertisements. He imposed a rule that no shipment of incoming tobacco would be accepted until one of the partners had personally inspected it. Cuba’s one and only cigar company, known in the industry as Habanos, was created in 1994 to oversee the distribution of all Cuban cigar brands. 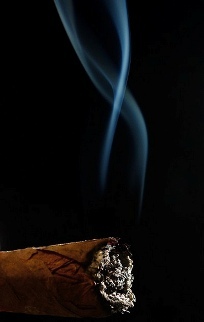 Cohiba, Partagas, Montecristo, and H. Upmann all belong to Habanos. And due to strong brand names that are synonymous with Cuban cigars, Habanos did not suffer the same degree of economic setbacks that other industries faced during the recession of 2008. Cigar sales declined but remained a relatively affordable product that consumers continued to purchase. While the market for $25,000 watches or $200,000 automobiles fell considerably, folks still felt comfortable spending $20 on a stick, even if they were a bit stressed economically. The biggest question facing the Cuban cigar industry is the future of the U.S. embargo. What happens if and when the embargo is lifted?